I just can’t get enough of this gardening business! The plants have finally started to take root and many are doing really well, despite the regular trampling from my dog Stella. I swear, that dog has sat, ran and dug into every plant in the yard! I’ve begun moving the more fragile plants away from the borders in hopes to save them. We’ll see if that helps…..
Had my first garden party with my work peeps the other week. 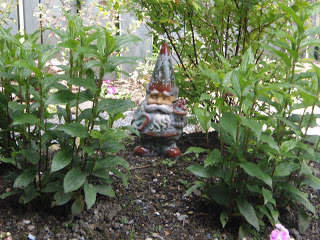 Recieved many fabulous garden accessories, including this guy above. Who doesn’t love a garden gnome? Photo: My shade bed is doing the best out of all of them. 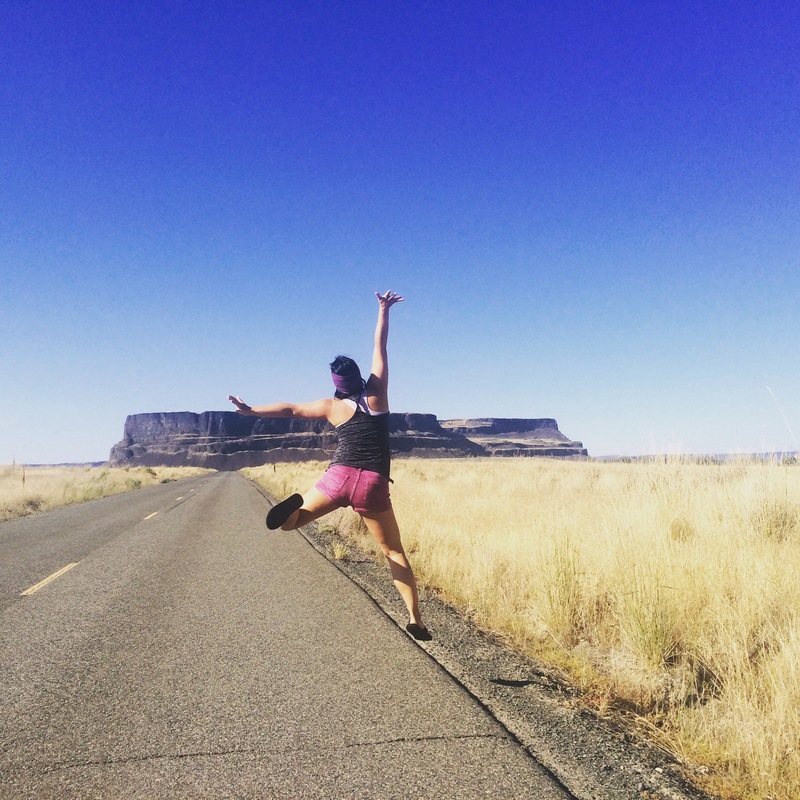 Who would have thought…. 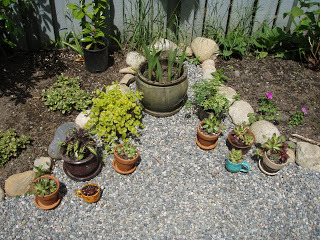 Photo: The container plants are surviving despite the endless rain. Photo: And my spring (?) 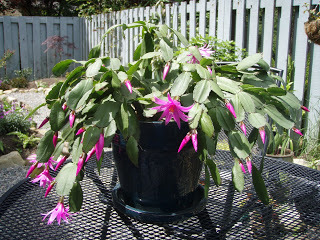 cactus is finally blooming after much babying under a grow light. So pretty……. 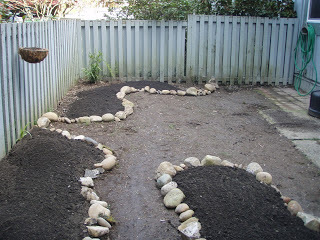 Well I can’t believe it – the garden is finally coming together! 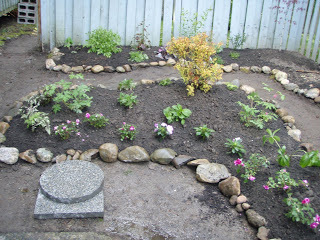 An expensive trip to Flower World, 5 cubic yards of dirt and lots of gravel has turned my soggy, sad yard into a pretty, relaxing garden. It’s still a bit rocky for my liking, but once the moss begins to fill in I think it’ll soften up a bit. A few well-placed planters might help too. 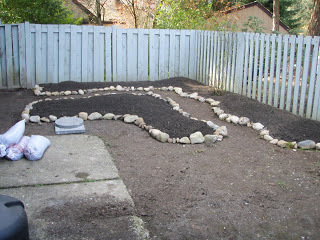 All of the plants and flowers are small so there are still a few empty spaces, but hopefully they will start to fill in by this time next year. I spent a lot of time questioning my placement of each plant but I really don’t feel as there’s a rhyme or reason to it. I’m hoping that plant repetition in each bed will kind of tie it all together. Watching things grow these past few weeks has also made me realize that plants from Home Depot, Fred Meyer, etc. don’t do nearly as well as the plants from Flower World and Molbak’s. They may be a bit more expensive, but they sure hold up a lot better. My poor Fred Meyer plants are really struggling right now! Unfortunately, the fence line is the only part that gets any sun so lounge chairs probably won’t work, but I am looking into some sort of outdoor seating for those BBQ nights (which we’ve had two of so far)! Nothing beats a few steaks on the grill! More pictures to come….my camera has been acting funny lately…..
Well, the day has finally come – my first trip to Flower World has been completed! My aunt, mom and I spent a few hours Saturday afternoon roaming the endless greenhouses of the infamous Malbty nursery in search of the perfect shade-loving plants for my newly landscaped yard. I’d heard from many fellow gardeners that it can be very overwhelming so I made sure to do my research and had a nice little list ready. We immediately went to the shade section and I picked out some beautiful toad lillies, ferns, bleeding hearts and lenten roses. 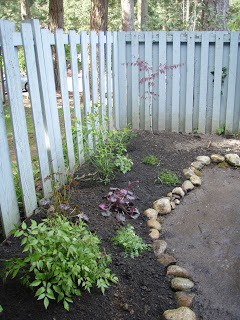 I also got two Japanese maples to anchor the yard as well as sweetbox and a hydranga to add some additional height. $300 dollars later, I had two full carts of lovely flowers and plants for my garden! Man, gardening isn’t cheap. A quick trip to Fred Meyer the next day for a few more plants completed my first weekend of gardening. There are still some holes that need to be filled in, but I’m happy with the results so far. I can’t wait for everything to grow! It’s starting to look like a jungle out there! 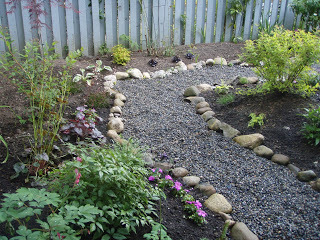 Photo: Astibles, coral bells and a Japanese maple round out this side. 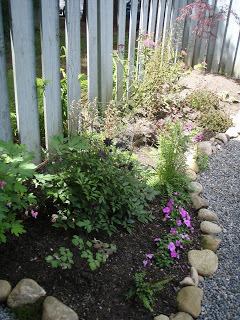 Photo: A Goldflame spirea centers this bed with bleeding hearts, ferns and annuals adding color and interest. Wow, I sound like a professional. 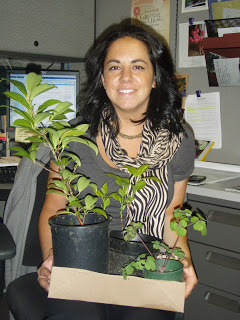 Photo: My first three plants courtsey of Chef Kurt! Spring is finally here and I’ve cleared my weekends from here on out for gardening! I put the finishing touches on my layout on Friday and figured it was time to get some good, composty dirt for my garden beds. 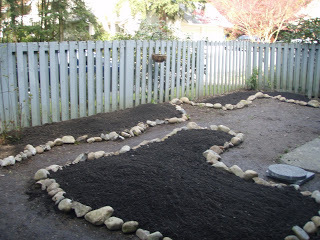 I’ve got an appointment with Flower World next Saturday with my aunt and mom so I needed to get the beds ready for all of the fantastic shade-loving plants I’m going to purchase. 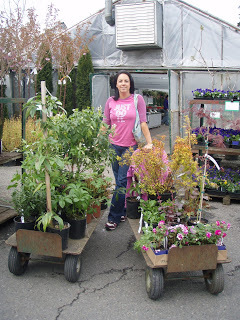 We picked out the garden mix at Rede-Soil in Redmond and got a nice big truck-load of the smelly stuff. 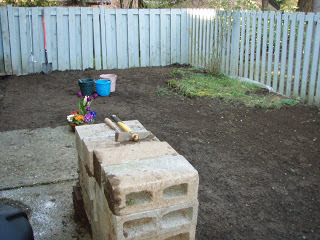 After one busted wheelbarrow and three hours of manual labor, we had a newly landscaped yard with raised garden beds! Unfortunately, it’s very stinky at this time, but I guess that means it’s nice and rich in nutrients. I’m trying to keep Stella out of it – the last thing I need is a poo smelling dog in the house! 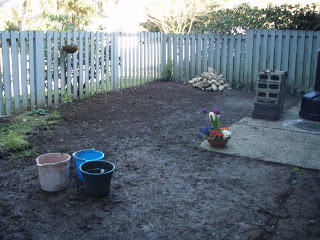 We’re going to fill in the rest of the yard with pavers and gravel with plenty of moss to soften things up. I’ll be glad when I can just worry about pulling up the occasional weed and not having to do all of this back breaking work!